Bub and I have really tried to do our best at embracing clean eating. I honestly think that we humans were not made to eat the processed junk that sometimes finds its way into our pantries. Bub and I and Baby Bub, inadvertently, have been doing our best to do most of our grocery shopping on the perimeter of the store rather than the interior aisles where much of the processed junk is found. I have always been drawn to the idea of joining a farmer’s co-op. I just like the idea of cooking and eating a local farmer’s harvest. Not to say that non-local vegetables can’t be tasty, but local, fresh vegetables just speak to me. There are some really awesome vegetable stands/ farmer’s markets in my county, many of which I frequent regularly. Until this Spring, I was not aware there are co-ops in my area. After the guest post from Rachel about how to actually save money at the grocery store, I started looking for an community supported agriculture (or CSA) opportunity around me. I went to Local Harvest, which led me to Jeta Farms: a local farm with CSA opportunities available. So, about 6 weeks ago, I signed us up to receive a box of veggies a week for 8 weeks starting the first week of June. It cost $25 a week or $200 but, since I paid for it all up front he gave me a 10% discount! So, $180 for 8 weeks of veggies. Sooooo, for 6 weeks Bub has been muttering under his breath that I spent $180 on nothing! That I had spent a hundred and eighty dollars and had nothing to show for it… Well, for the most part he was just teasing me but somewhere deep down he did not fully appreciate the awesomeness of joining a CSA. He was not nearly as excited as I was about it. 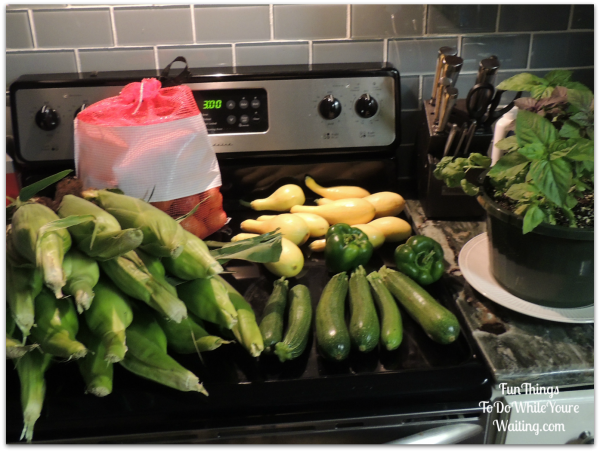 It finally came time for us to get our first box of fresh, locally grown veggies. The farmer and his wife are so nice- they have made me a complete believer in this whole process. And the big box of veggies plus the basil plants made Bub a complete believer too! So, this week has been fun cooking all these great veggies. The very first night I went straight to my Moma’s cookbook to see what I was gonna do with the squash. 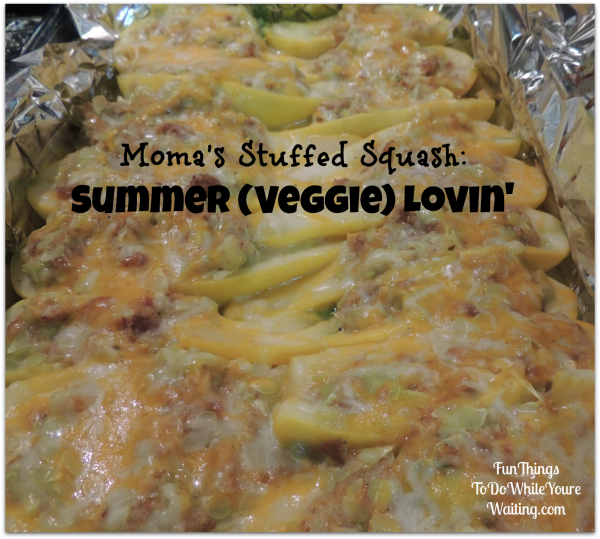 I quickly decided to make Moma’s Stuffed Squash- I knew they would be quite tasty. The recipe calls for you to boil your squash until they are tender, then slice them in half length-wise and scoop out the middle. The next step in the recipe is to combine the middle with an egg, some grated onion, melted butter, bread crumbs, a little cheese and salt and pepper. And then to spoon it back into the scooped out squash and the top with cheese. In this instance I decided to do the mixing with my hand. My hand was clean and middles of the squash did not seem to want to cooperate with my spoon, so I just went for it. It worked for me. Finally, I topped the stuffed squash with cheese and put them in the oven for 30 minutes on 350 F. What came out was truly a tasty creation! These were so tasty and pretty easy to make too! I suggest you pick up some fresh whole squash and give it a try! Place squash in boiling water and let boil for 10-15 minutes until tender. Remove from water and allow to cool. 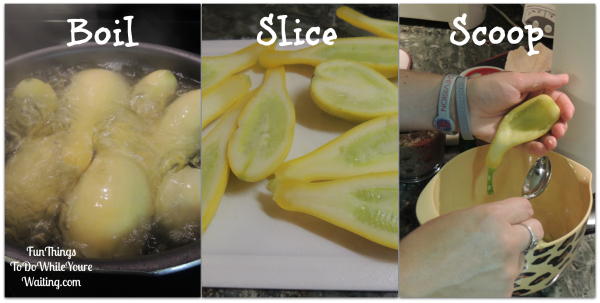 Slice squash in half lengthwise and carefully scoop out center and lay the shell in a greased pyrex. 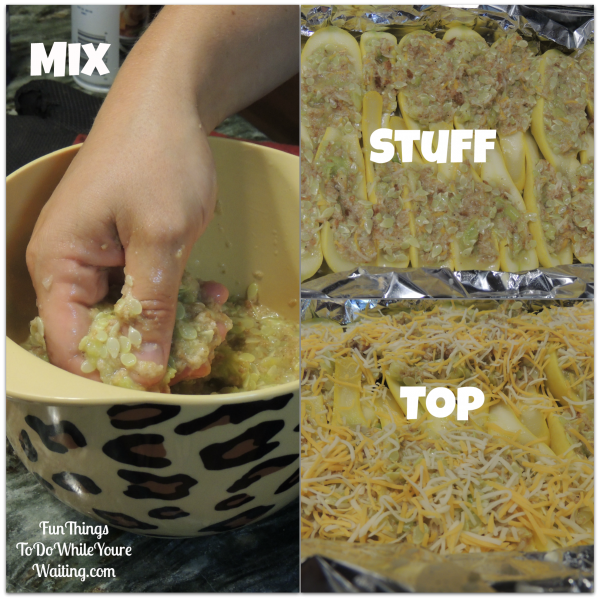 Mash and mix the scooped out squash with the onion, butter, bread crumbs and ½ cup of the cheddar cheese. Top the squash with the remaining cheese. 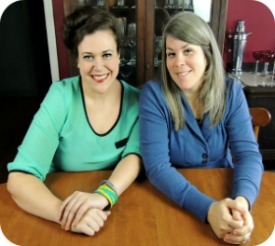 Cookbook Shoutout!, Coralie!, Healthy, Side Dishes, What's Cookin'? 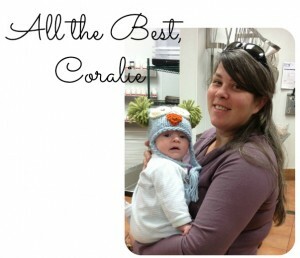 Cookbook Shoutout!, Coralie, CSA, Healthy, Mary Made It!, side dish, Squash, Summer Veggies, What's Cookin'? Previous Article← And… We’re Here!